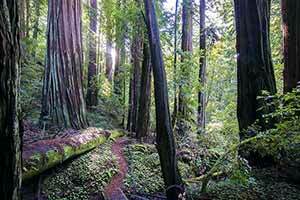 Portola Redwoods is just two miles north of the much better-known Big Basin Redwoods. Its trees may be smaller, but it’s still pretty scenic and it’s also a lot less busy. 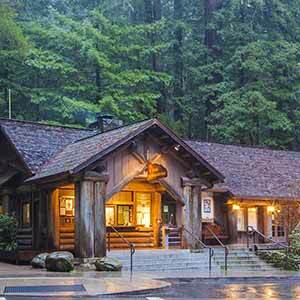 It’s a great choice if you’re looking for a quieter, more secluded redwood experience. 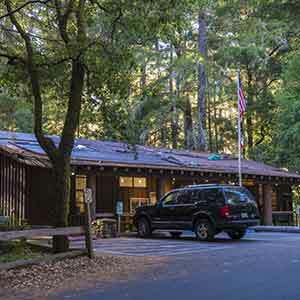 The park’s main entrance and visitors’ center are located in a redwood grove that’s been protected from logging since 1924. The interpretive signs say the region was selectively logged before then, but most of the area still appears to be old growth with few or no stumps. 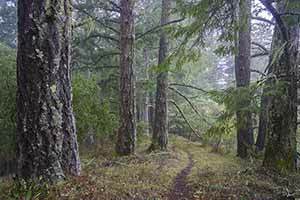 Lawrence Fox’s seminal 1986 redwood inventory even classifies the area as old growth. The grove has a lush upland appearance; at lacks the really big trees normally found in an old-growth redwood lowland, but that’s probably the natural condition of the area. 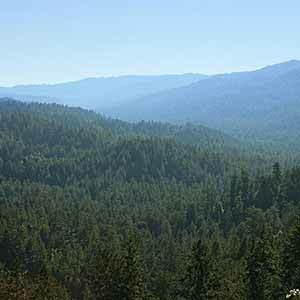 It’s possible that Portola escaped significant logging because it was too far from the mills and didn’t have the big redwoods that nearby heavily-logged locations, like the Middleton Tract and Slate Creek, offered. 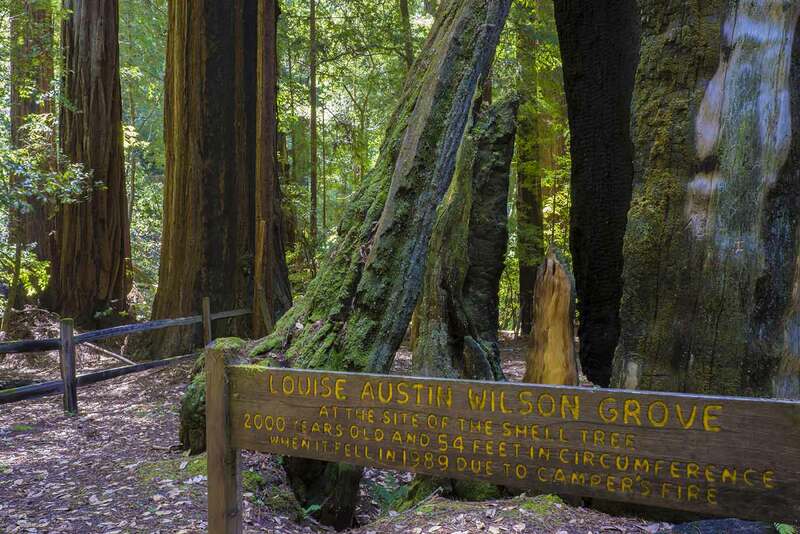 Besides the main grove, the park has two remarkable outlying groves: Peters Creek, which is old-growth and can only be reached by a long trek with lots of climbing, and Slate Creek, which has been heavily logged but is nontheless quite scenic and easier to reach. On a side note, the Portola visitor’s center has one of the best park relief maps I’ve ever seen. 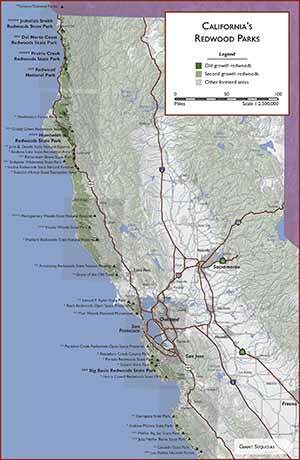 The big, detailed three-dimensional map covers not just Portola but much of the Santa Cruz Mountains. 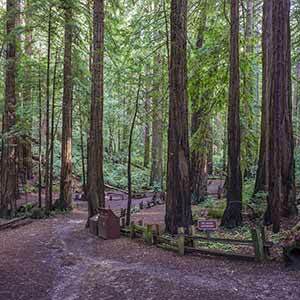 A strenuous hike through unexceptional redwoods to a scenic redwood-filled canyon. This hike is a nice introduction to the area. Half the hike is in Portola and half in Pescadero, and the loop highlights the subtle differences between the two parks. 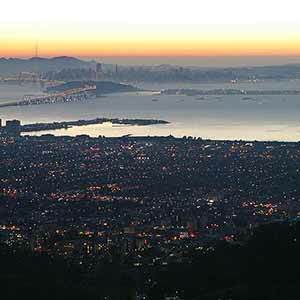 Located in a deep shady valley, this one of the Bay Area’s nicer redwood campgrounds. There aren’t any really huge redwoods but it’s quite attractive. 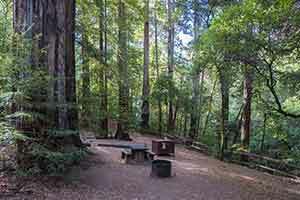 This backcountry trail camp, set in pleasant but unremarkable woods a 3-mile hike from Portola’s visitor center, has a nice remote feel. 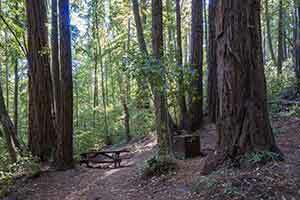 Jane Huber’s BAHiker website has a page on Portola Redwoods.